Rev. Bill Walker is the new pastor at the Grace Brethren Church in Waldorf, Md. (from the Southern Maryland News). Grace Brethren Church of Waldorf welcomes its new pastor, the Rev. Bill Walker. Congregation members welcomed Walker to its fellowship, where he and his family began serving in March. 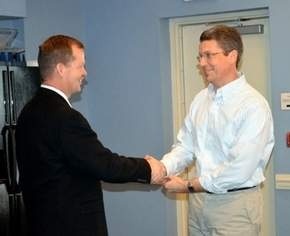 Steve Collignon, left, congregation chairman, congratulates Walker as he accepts his new role.